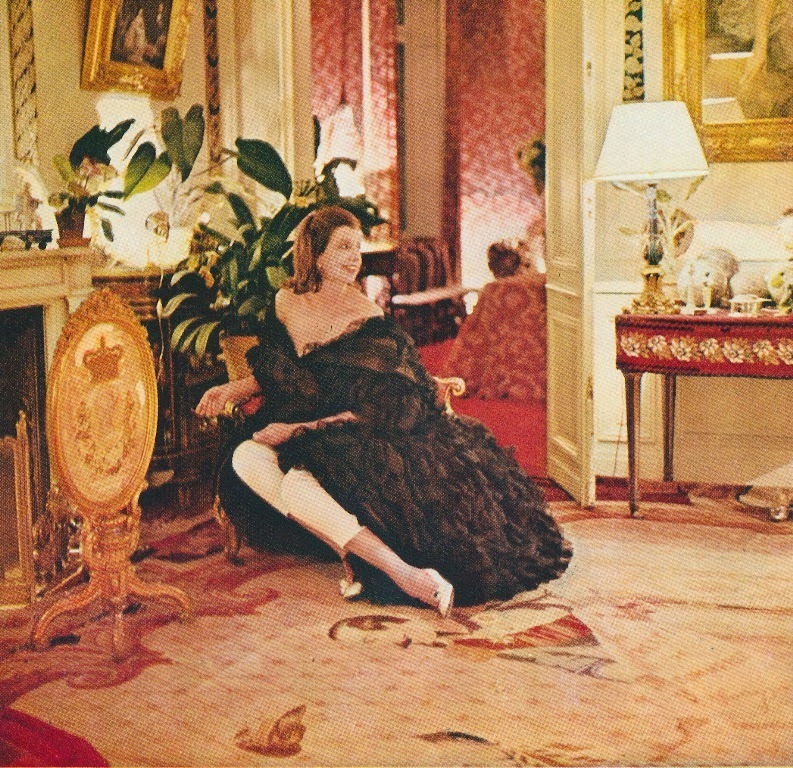 Even if at first glance you didn't realize that the woman pictured above was Pauline de Rothschild, you might have guessed pretty quickly that the elegantly-frocked, coquettishly-posed woman was some kind of doyenne of stylish living. Of course, that guess would be correct, because de Rothschild was indeed a master at the art of living well. Menus are brought to her in bed. 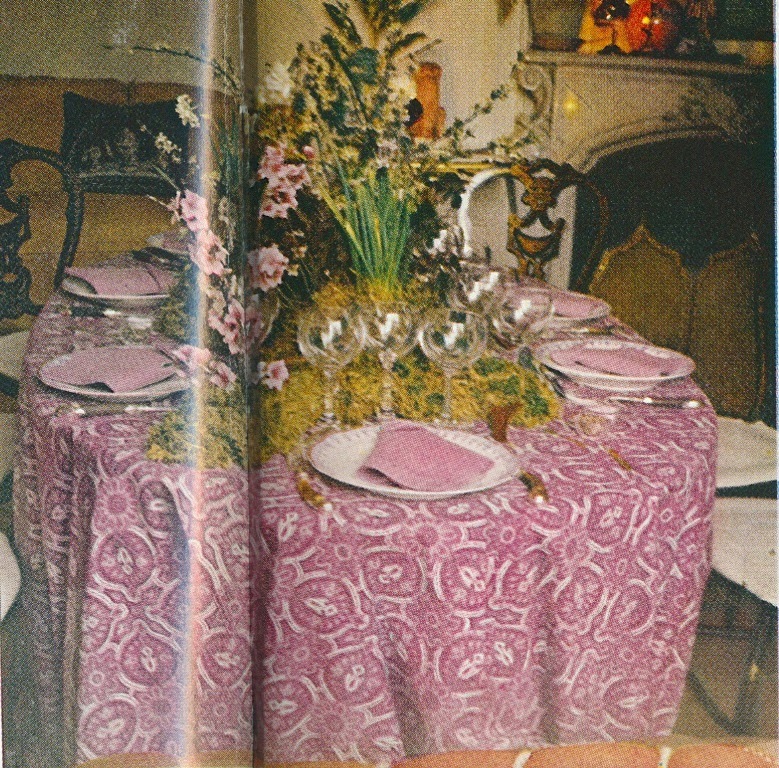 So is a book with photographs of the luncheon and dinner services (one hundred and seventy of them, all told), and other books with swatches of the tablecloths and napkins (an equally prodigious variety) to choose from for the day. Marie, the flower-arranger, telephones for instructions before going off on her little motor bicycle in search of moss and branches and blossoms. Like I said, elaborate, but with one hundred and seventy luncheon and dinner services at her disposal, a book of photographs would have been a necessity, don't you think? Then there is de Rothschild's soft-paste Chantilly décor de brindille dinner service, a wonderful blue and white china that she chose for the aforementioned terrace luncheon as well as for a different table setting pictured in L'ŒIL. 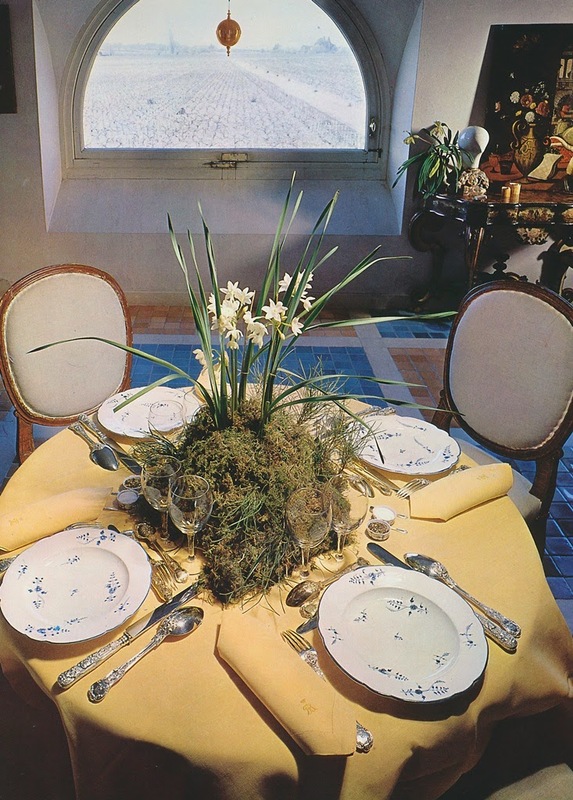 That setting included a yellow cloth and napkins, 19th-century silver and vermeil flatware, and an arrangement of moss and narcissi. (Marie, the flower-arranger, must have gathered the moss and blossoms.) Quite frankly, writing about all of these different combinations is making my head spin, so perhaps I should simply end it here and encourage you to look at the photos below to see the different ways in which she used what were presumably some of her favorite pieces. And if you are anything like Pauline de Rothschild and own the amount of china that she did, then all I can say is, good luck with keeping it all straight. *A few days after writing this post, I read the November issue of World of Interiors, which includes an article about Pauline de Rothschild and her Paris home. The photographs of her home were taken by Horst. The article is definitely worth reading, if you have not yet done so. The blue and white paisley cloth and Chantilly décor de brindille dinner service, which appeared in Vogue. 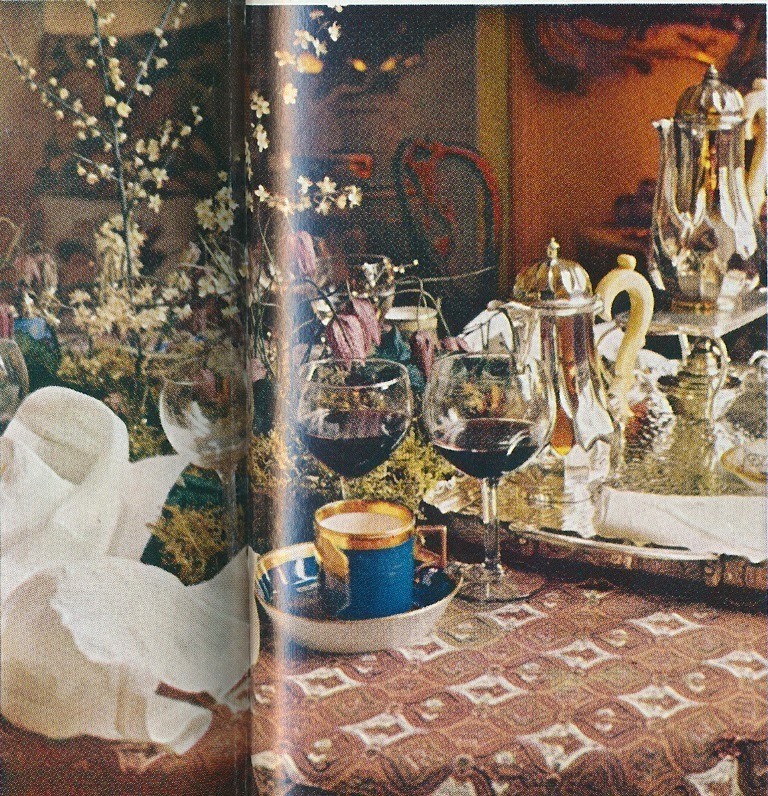 Also photographed for Vogue was this table, which was set for after-luncheon coffee. This time, a brown and white version of the paisley cloth was used. In L'ŒIL, a mauve version of the paisley cloth was used. The polychrome Creil plates have hunting scenes on them. The arrangement included catkins, dried ferns, and oak leaves. Another L'ŒIL photograph. 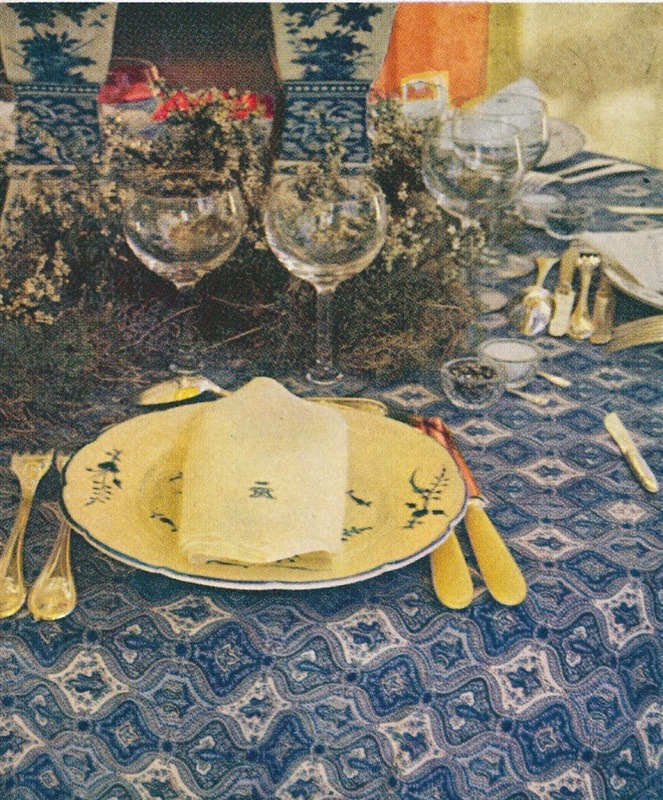 That charming Chantilly décor de brindille dinner service was set on top of a yellow cloth. The 19th-century flatware was made in England for Philippe de Rothschild's grandfather. I included the two photos, above, simply because they were additional examples of de Rothschild's fondness for exotic-print fabrics. Jennifer, These fabrics and china services are as current now as they were then. I also love that she used so many natural elements in her table centerpieces. Hello Jennifer, Somehow, my admiration for these photos is mixed with being taken slightly aback. Those centerpieces, while probably fine for a side table (albeit a little on the weedy side), don't work so well on a dining table where they overflow unpleasantly into the area reserved for food, dishes, cutlery, etc. 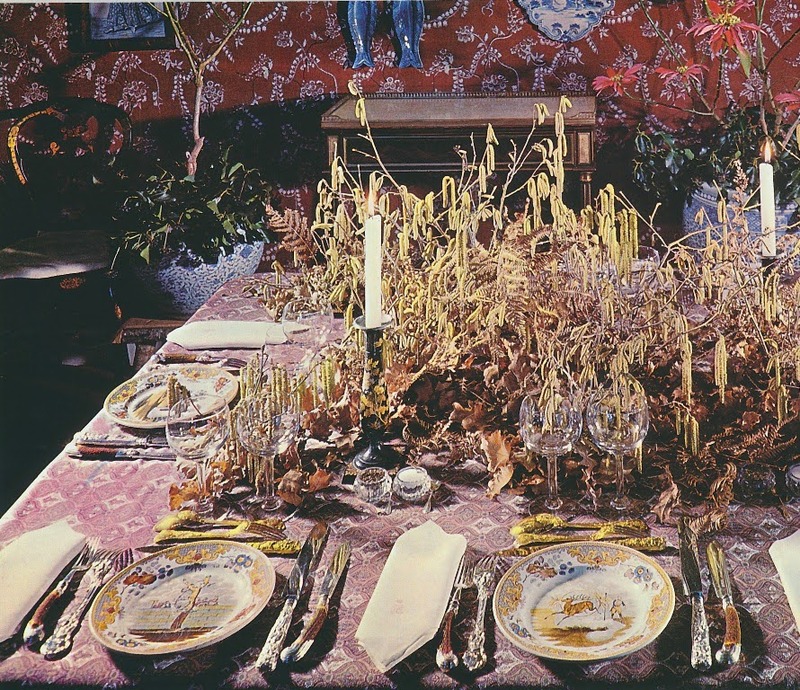 The first photo established de Rothschild's style and verve to such a degree that I'll bet those off-putting table settings were over-done and exaggerated for effect, possibly by the photography director. Beautiful. I wonderful how large her staff was?? Incredible attention to detail. Those mauve linens and tablescape are absolute perfection! Agree with Parnassus. If the food and wines are wonderful, these department store window displays would be distracting, at best. I don't disagree that the table settings were a bit over the top and perhaps even contrived. I do, however, think that these photos provide a fascinating glimpse at the lifestyle of a woman whose sense of aesthetics was remarkable and perhaps affected. Rosamond Bernier gave a fascinating account of being a guest at Mouton: everyone was held to the highest standards of dress, conversation, wit, and participation in all events. Woe to anyone who slipped up a little bit. Sounds quite nerve-racking in retrospect. She was a true artist!